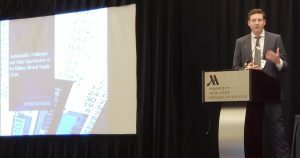 Lachlan Broadfoot, CEO of Behre Dolbear, speaking on Sustainability Challenges and Value Opportunities in the Battery Mineral Supply Chain, S&P Battery Metals Conference in NYC, October 18, 2018. TIANJIN, China (Reuters) – A rebound in mining mergers and acquisitions is set to continue into 2019, led by companies from top metals consumer China, as a dearth of exploration spending leaves the industry in need of fresh investment, delegates told a conference on Thursday. Sector M&A in mining powerhouse Canada had its best quarter in more than seven years in July-September, spurred by Barrick Gold Corp’s (ABX.TO) planned $6.5 billion acquisition of Randgold (RRS.L) and Chinese firm Zijin Mining’s (601899.SS) C$1.86 billion ($1.43 billion) deal to buy Nevsun Resources (NSU.TO). TIANJIN, China Oct 19 (Reuters) – Shandong Zhaojin Group , one of China’s biggest gold miners, is scouring assets in South America as it looks to invest in its first overseas mining project, its general manager said on Friday. The company has set up a representative office in Machala, capital of Ecuador’s El Oro province, historically a gold-producing region, and will use this as a base to participate in South American projects, Liu Yongsheng told Reuters on the sidelines of the China Mining conference in Tianjin. Ecuador had both gold and copper reserves but the “exploration work is still very rough”, so very large financial resources would be required to invest, he added. Shandong Zhaojin, China’s fourth-largest gold miner after Shandong Gold, China National Gold and Zijin Mining Co, has also set up overseas units in Canada and Australia, Liu said. Another executive from the company said in September 2017 that Shandong Zhaojin wanted to establish an overseas mining presence within a three-five year time frame. “We have a lot of projects being discussed,” including in Russia, Central Asia and Africa, Liu added. Speaking at the same conference, Woo Chan Lee, China president at Barrick Gold Corp, said his company wanted to “get to know Shandong Zhaojin much better” over the next year as he pledged more opportunities for cooperation with Chinese firms following Barrick’s proposed merger with Randgold Resources. Barrick already partners Shandong Gold at the Veladero mine in Argentina and Zjin Mining at the Porgera project in Papua New Guinea. Woo said he was “confident” China Gold and Barrick would be partners in the future. Samarco’s half-owner Vale SA (BZ: VALE3) reportedly expects the iron ore operation in Brazil could partially restart in 2020. Operations at the mine, a 50:50 partnership with BHP (ASX: BHP) have been suspended since the Fundão tailings dam failure in November 2015 which caused 19 deaths, widespread flooding and has been described as Brazil’s worst environmental disaster. Vale CEO Fabio Schvartsman told an event in Rio de Janeiro this week that Samarco could resume at a third of its capacity at the start of 2020, Reuters reported. “All indications are that there will be no problems and that, by the beginning of 2020, all issues will be overcome and it will be possible to resume operations,” the wire service reported him saying. Vale and BHP reached agreement with Brazil prosecutors in June to settle a BRL20 billion (US$5.3 billion) civil lawsuit and progress settlement of a larger BRL155 billion claim. BHP settled a separate class action in the US in August, by paying $50 million to investors with no admission of liability. Vanadium pentoxide prices reached a new all-time high Thursday in China at US$29.20 per pound, gaining 2.09% on Wednesday’s final estimate. The metal has been on a meteoric rise to its new high, which compares with its typical historic price range of between $3-$5/lb, last seen as recently as early in 2017. The trend is predicated on divergent vanadium supply and demand that have set up the market for an estimated 23,000-tonne deficit by 2025, providing a basis for prices to spike further. Research has vanadium consumption conservatively forecast to grow at a compound annual growth rate of 5.6%, reaching 133,000t in 2025, outpacing slated production growth – including all idle capacity and the expansion of existing primary mines – which has been predicted to achieve a CAGR of 3.7% to 111,000t in 2025. 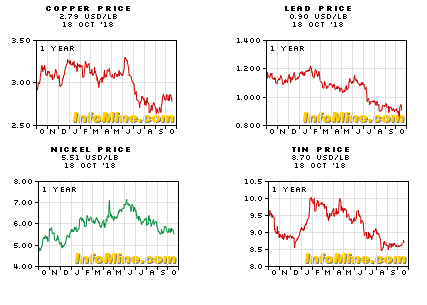 The genesis of the current predicament can be seen in the price slide following a 2008 high of about US$14/lb, to historic lows that resulted in significant and permanent rationalisations in supply – most notably involving Highveld Steel, in South Africa. This removed a significant volume of production potential, with no projects able to fill the void. The cobalt price halted its decline of recent months with the September average price of US$66,334/t up 6.6% month on month. This is well below the month-average high of US$90,421/t that was reached on the back of speculative activity in May. The ex-China cobalt cash price touched a low of US$61,556/t in mid-September before lifting a little to finish the month at US$61,874/t. LME inventories posted their eighth consecutive rise during September, adding 33t to reach 723t. Visible stocks on China’s Wuxi Stainless Steel Exchange (WSSE) were drawn down 83t to 136t. Producer-held stocks in the US are estimated by the United States Geological Survey (USGS) to be 1.2kt. Whilst visible inventories account for only 2% of the market, China’s State Reserve Bureau (SRB) is estimated to hold inventories exceeding US producer stocks, whilst Cobalt 27 holds a reported 2.98kt in warehouses. The dubious cobalt sourcing practices behind companies operating in the DRC are now facing heightened scrutiny. In early October, the London Metal Exchange (LME) published a paper seeking to implement responsible sourcing practices, and allowing rapid action to remove brands thought to be in breach of human rights. TORONTO/LONDON (Reuters) – Anglo American unit De Beers is going after lucrative, but elusive high-tech markets in quantum computing, as it aims to expand its lab-grown diamond business beyond drilling and cutting. 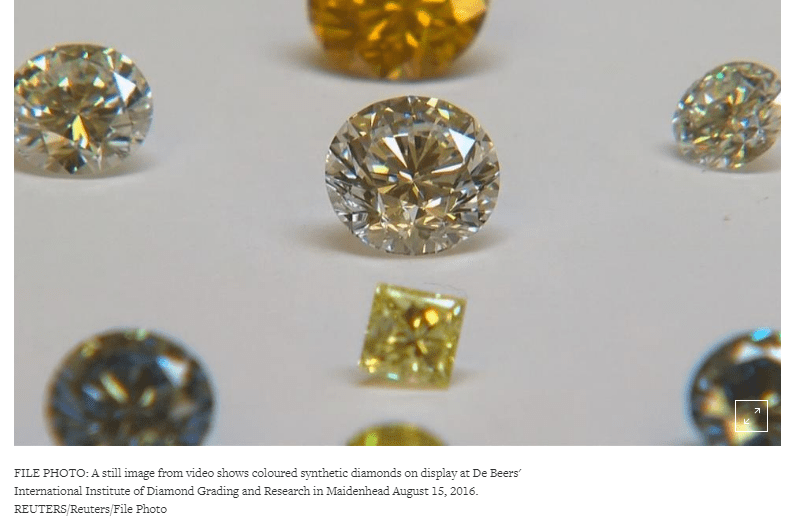 Element Six, De Beers’ synthetic diamond arm, is building a $94 million factory in Portland, Oregon, an expansion that comes as scientists from Moscow to London push to develop diamonds for futuristic applications. Researchers have long chased the synthetic ‘holy grail’ of diamond semiconductors, without commercial success. Resilient to extreme temperatures with super-conductive properties, diamonds can withstand conditions that silicon cannot, but roadblocks around cost and production have thwarted developers. Now coming of age after decades of experiments, technology called chemical vapor deposition, or CVD, offers a path to higher-quality, lower-cost production of synthetic diamonds and that opens the door to potential new computing markets. The Yomiuri Shimbun Despite soaring interest in Japanese swords, particularly among young women who play popular online games featuring swords, natural whetstones that are essential to polishing the blades are on the verge of extinction as artificial versions become more common. Natural whetstones were once mined at nearly 200 sites throughout the country. However, only a few such mines remain active today. Professional sharpeners of the swords are concerned because they claim artificial whetstones fail to bring out the natural brilliance of swords. Sharpeners polish swords forged by swordsmiths, bringing out wavy, wood grain-like patterns on the surface of the blade to elevate the weapons into works of art. Natural whetstone is indispensable for polishing swords. It is made from sedimentary rock and is fine-grained, crucial to making a sword shine, the final step in the sharpening process. A variety of natural whetstone called Uchigumori produced in Kyoto Prefecture that is especially fine-grained has long been valued as superior for sharpening. But natural whetstone is now in danger of disappearing from the market. 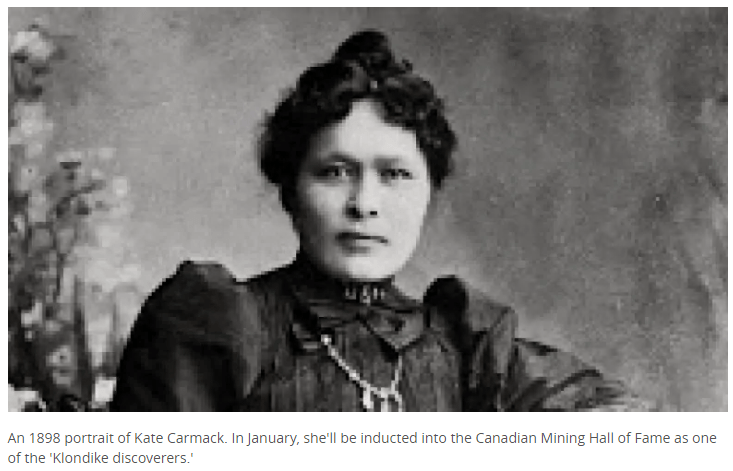 Kate Carmack, the Indigenous Yukon woman who played a significant role in the discovery of gold in the Klondike more than a century ago, will finally take her place in Canada’s Mining Hall of Fame. Her induction comes two decades after four men — including her husband, brother and nephew — were added to the hall of fame and credited as the “Klondike discoverers” who first found gold in Bonanza Creek in 1896, and ultimately sparked a gold rush. “If you go into the history of the reporting of the Gold Rush, of course you find it heavily centred on the men who were involved,” said Jon Baird, chair of the Canadian Mining Hall of Fame. As North American markets limp through declines not seen since February, investors are scurrying to park their money in a familiar “safe haven”: gold. 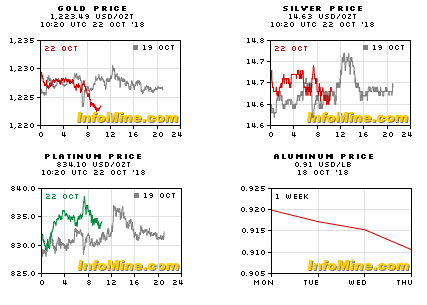 The yellow metal has undergone a mini rally since last Wednesday, when the Dow Jones Industrial Average shed more than 800 points amid a bout of global market skittishness. Last Thursday, the price of gold jumped to US$1,227.60/oz from $1,193.40 and, after a small dip Friday, prices continued to rise Monday, surpassing US$1,230/oz as the Toronto Stock Exchange closed. Canadian gold miners have seen their share prices soar as a result. LUSAKA, Oct 17 (Reuters) – Mining companies operating in Zambia will still meet their operational costs even after the government imposes higher taxes in Africa’s No.2 copper producer, its finance minister said on Wednesday. Coal miner Coronado Global Resources will push on with plans to make its ASX debut after raising $774 million in a disappointing initial public offering that was originally targeting as much as $1.4 billion. Coronado is the United States’ largest producer of metallurgical coal, used in steelmaking, and has assets in Queensland’s Bowen Basin and Virginia’s Central Appalachian region. 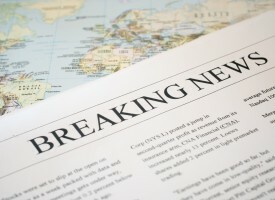 The company expects to begin trading on Tuesday under the ticker CRN. Coronado chairman Greg Martin and CEO Gerry Spindler said they were “very pleased” with the result which was the largest metals and mining IPO since 2004 and the ASX’s largest coal float in history. “We are very excited to commence our life as a publicly listed company in such a formidable position. With a robust balance sheet and substantial operating cash flows, we are well placed to achieve our objectives and deliver meaningful returns to shareholders,” he said in a statement. The company said the offer was oversubscribed and delivered Coronado with a diverse shareholder base. It took more than seven years for automakers to sell 4 million passenger electric vehicles. It’ll take about six months to sell the next million. That surging demand is transforming the lithium-ion battery business, with more power packs expected to be installed in EVs this year than in consumer electronics, according to Bloomberg NEF. China, where subsidy-toting drivers own a third of the world’s passenger EVs, is doing the most to fuel the boom. The market value of batteries used in electric cars, electric buses and related energy storage should multiply by about 10 times to a potential $500 billion by 2050, according to Sanford C. Bernstein & Co. research. Many of the biggest battery producers aren’t benefiting now because they’re spending billions of dollars to add manufacturing capacity and form global partnerships with automakers. Down the line, though, the trend changes.